Blues musician Seth Walker made a quick stop in Grand Rapids between gigs in Japan and Traverse City. It was a backyard concert that won't soon be forgotten. Finished handspun yarn with letterpress labels. Prepping yarn into 3.5 oz/100 gram skeins. 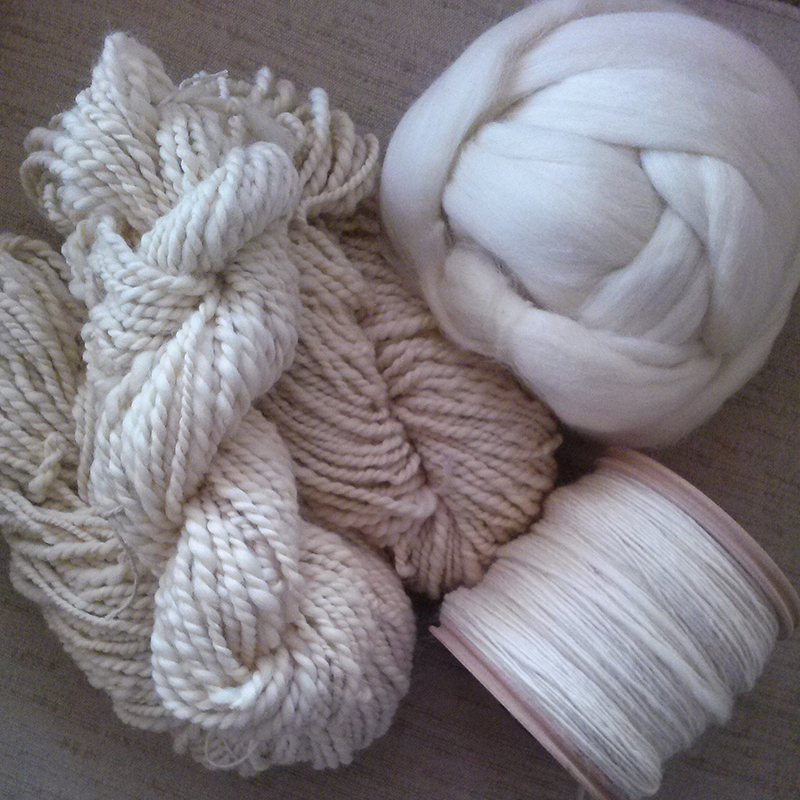 Washed handspun drying on the front porch. Ashford Traditional spinning wheel and LeClerc Franny loom. Plying on an Ashford Traditional with a Jumbo Flyer. Yarn can be currently purchased in limited quantity in the shop or you can also purchase in person or online at Have Company located at 136 Division Ave South in Grand Rapids, MI. Twill scarf using Amitola by Louisa Harding. A Wool/Silk blend. Weaving Project #1 using a wool blend warp and a Wool/Silk yarn brought back from Tokyo in 2005. I will be working on moving this blog to my website over the next month. Mix media wall sculptures. Wood and fiber. Art Book made for the 10th Anniversary Free Radical Gallery tour on October 26 and November 2. Today was a rain day at work so I had extra time to do a little more sewing. Got it all ironed out and edges sewn and delivered to Art Express for framing. Calling it done unless it ends up being a rain day for work tomorrow. It is going to the framer in the morning. Working on details. Feeling frazzled and I hope that I can get this done by Monday when it goes to Art Express for framing. Stitching at at the Giants vs. Padres game. Giants won 8-3. Not much stitching done today but I did get the first batch of 2"x 2" cards ordered. Headed off to see the Giants play the Padres tonight!